©℗ 2000 Metal Blade Records Distributed by RED Distribution in the U.S.A. 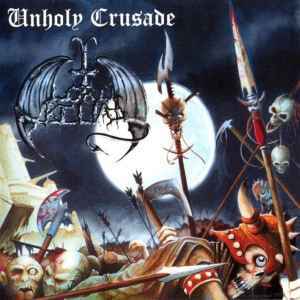 In late '99 I received an advance copy of "The Unholy Crusade" CD from Metal Blade (I was a Radio DJ). Came in a jewel case and looks like the real thing - 'till you put the CD in to play. The CD print says Lord Belial - but the music actually on the CD is Mac Wiseman "24 Greatest Hits" (Country/Bluegrass)!! CD has no matrix or runout code. Barcode has a small punchout in back, otherwise barcode and all else is identical to this release. Anyone else have this version?